Timothy Stiles, Global Chair, International Development Assistance Services, KPMG in the U.S.
Timothy (“Tim”) Stiles is the Global Chair of KPMG’s International Development Assistance Services (IDAS) Practice and has responsibility for the global delivery of KPMG’s services to organizations operating in the development sector. He is located in the firm’s New York office. 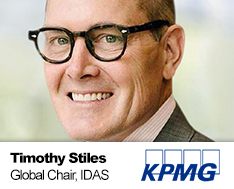 In addition to his IDAS responsibilities, he is also the National Practice Leader of KPMG’s Development and Exempt Organizations (DEO) practice, is the chair of the KPMG Global Public Sector Tax steering committee, and serves as the Global Executive Partner for the United Nations. Tim also was instrumental in founding KPMG’s Global Grants Practice in 1999 as well as KPMG’s national EXOTAX practice in 1995. He has served in the exempt division of the firm’s Washington National Tax Practice. Mr. Stiles has over twenty five years of experience providing services to development and tax exempt organizations. His clients have included social service organizations, institutions of higher education, hospitals, governmental entities, museums, foundations, bi- and multi-lateral organizations and other entities with local, national, and multi-national operations. He focuses exclusively on serving not-for-profit organizations, development agencies, universities, family foundations, corporate foundations, and private foundations, and other grant-making organizations. Mr. Stiles currently heads KPMG’s Development and Exempt Organizations practice, assisting organizations making grants and funding projects for a variety of charitable purposes in over 145 countries on six continents. His program has participated in more than 4,000 grants and projects valued at more than US $6,000,000,000. ― Benchmarking and landscaping of not for profit initiatives. ― Mr. Stiles is a member of the American Institute of Certified Public Accountants. ― He is licensed in California, New York, and Washington.